One of the biggest challenges that content managers for two-year colleges face is making multi-media content accessible. Audio files need to be transcribed into a written format and video files need to have captions. 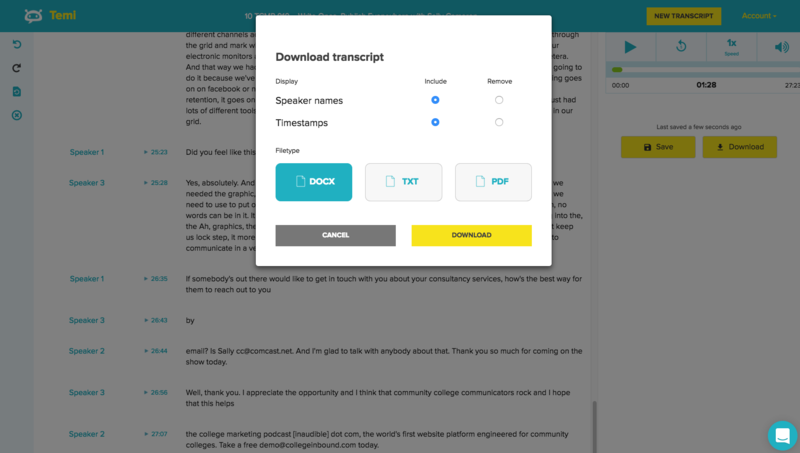 We transcribe all of our audio podcasts here at College Inbound using a website service called Rev.com. 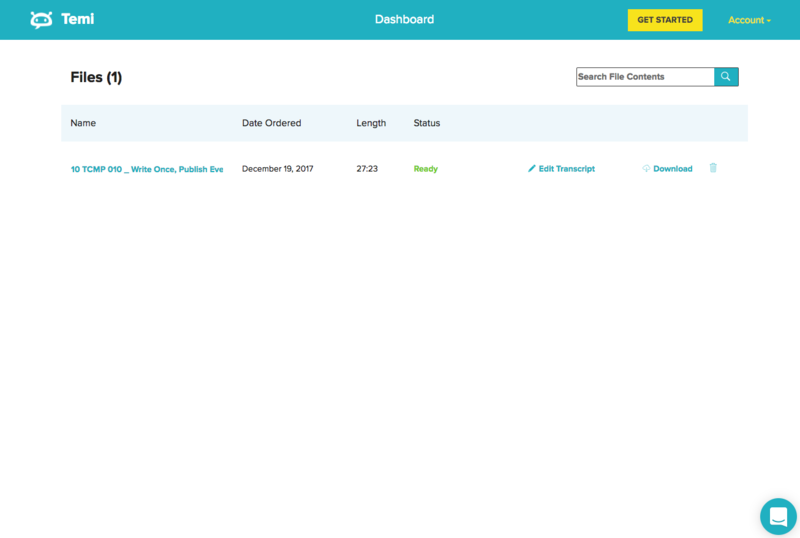 Rev.com is a really neat service that allows you to quickly provide a link or file upload of your audio or video files. They match up your project with a freelance transcriptionist that will transcribe your file for a cost of just $1 per finished minute. If I send them a 30-minute podcast, it will cost us $30. The best part is they deliver a fully-transcribed file within 12 hours. Thanks for being a Rev customer. I’d like to give you a sneak peek at our newest service, Temi.com. 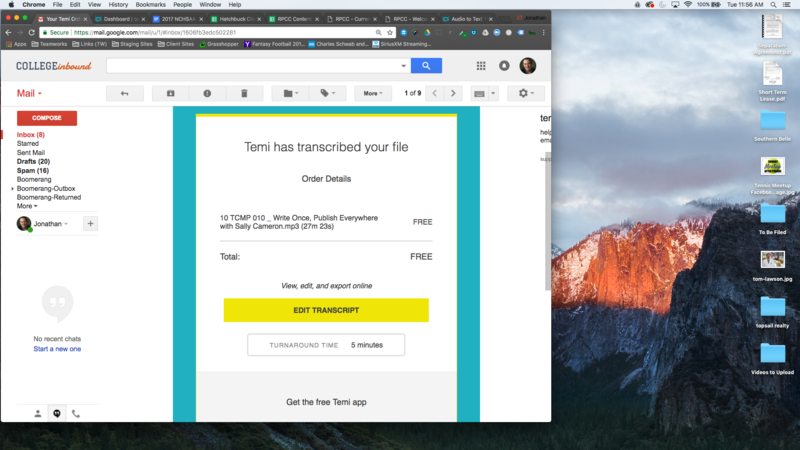 Temi provides automated transcription. It is 90% cheaper than Rev and 10x faster. What’s the catch? Only use high-qualityaudio, like this (no background noise, few speakers, and clear, loud voices). If you have high-quality audio, Temi could be a great option for you. I would love to hear what you think. Email me anytime, JasonC@Rev.com. p.s. Rev.com will continue to offer great quality transcripts for $1.00/min. It’s not going away. The cost of using Temi.com is just $0.10 per minute of audio or video. So that same podcast transcription that cost me $30 would now just cost $3. That is a tremendous amount of savings! I decided to take one of our last podcast transcriptions that we ordered through Rev.com and give Temi.com a try to compare the results. You can view the full unedited version of the Sally Cameron Transcription from Rev.com here. This podcast was 27 minutes long, so the fee from Rev.com was $27. I ordered it at 12:13pm and had the transcription sitting in my inbox by 2:54pm that same day. Pretty impressive! The Temi.com automated transcription service was blazing fast. I received an email notification within 3 minutes that my new transcription was ready to review. 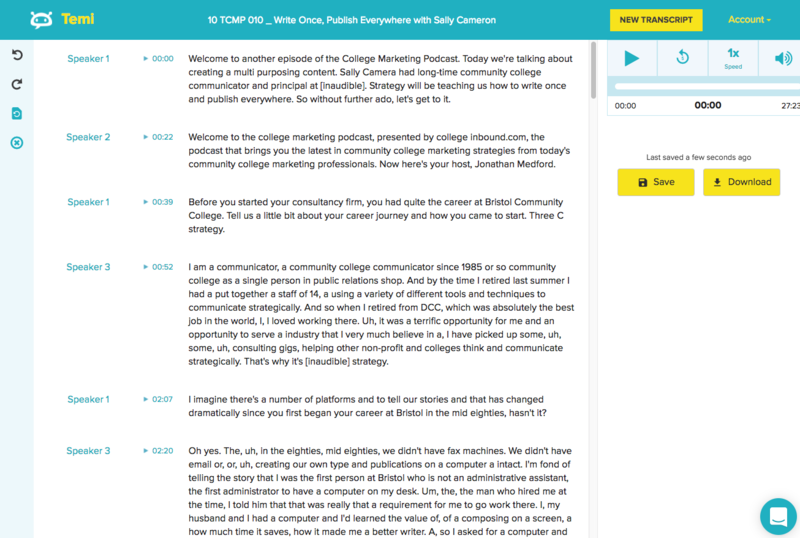 Here is how the Temi.com version of the Sally Cameron interview came out. Now keep in mind that with Rev.com you have an actual human being that is transcribing your document and making corrections for you. You have the ability to rate the quality of your transcriptions and if you get a particularly careless transcriptionist, you can select an option to make sure that transcriptionist is never auto-assigned one of your projects again. I have never had a Rev transcription turn out that bad, but you still have to go through and edit your files to make sure that names and local places are spelled correctly. Temi.com is fully aware that their automated transcription service is going to have mistakes. To combat this, they have built a very user friendly transcription editing tool that allows you to make corrections. What’s neat about it is they give you a media player that plays the audio or video file while highlighting where the media file is in the text by highlighting it in yellow. Temi.com also has some other limitations that they are good to warn you about. If you want to utilize this service, your audio needs to have little background noise and clear speakers with minimal accents. If your audio meets this criteria they claim a 90-95% accuracy rate. If your audio has heavy background noise, crosstalk or strong accents, you may need to utilize Rev.com instead. Overall, you may find yourself spending a little bit more time editing and correcting a few more mistakes on Temi.com than you would on Rev.com but we feel that the 90% savings is just too darn good to pass up. Thank you for your thoughtful post with accurate descriptions of our services and their pros/cons/limitations! At Temi, our mission is to make our customers’ work easier. 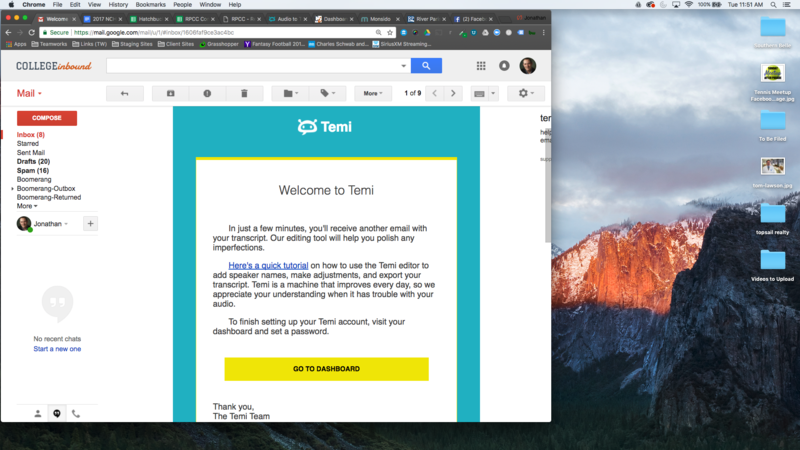 We are thrilled that you find Temi helpful, and we pledge to continue to improve the accuracy of our algorithm and the tools that make it easy to adjust the output and collaborate with others. Thank you for reaching out Austin. I just got through using Temi.com for our latest podcast episode. The editor tool is such a breeze to use. Congrats on launching such a cutting edge product! Looks like a great service. We just used on last week that wasn’t this good and with the launch of our new podcasts this is perfect timing. Thanks! Great to hear from you Jonathan. Can’t wait to see what you guys are doing with your podcast at Catawba Valley Community College!